This is a set of 2 steel tracks bought from McLaren. MCLAREN HYBRID STEEL TRACKS are designed to handle the most extreme ground conditions. 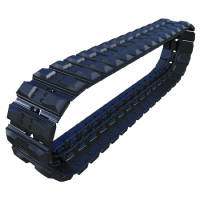 They are virtually unbreakable, last twice as long as regular rubber tracks and easy to install. NOTE: Please make sure the make and model you have selected, matches exactly the make and model on your machine production plate.